1.Bands ONLY Fit for Fitbit Charge 2. 3.Do not clean the bands by water, soap, detergent or other chemical cleaner. Warranty: 30-Day money back, 18-month warranty for quality-related issues and lifetime friendly customer service. 1. Premium Material: Made of superior quality genuine leather, trendy and retro style, nice replacement strap for your Fitbit Charge 2. 2. Secure Design: A stainless Stain Buckle and Two Fastener Rings help to make the band more tightly and safely. 3. Exquisite Handcraft: Each strap and every detail are carefully crafted by the master craftsman. 4. Handsome Present: This Fitbit Charge 2 genuine leather strap is a perfect gift for your families, friends, loved ones and yourself. PREMIUM MATERIAL: SKYLET Fitbit Charge 2 Band is made of superior quality genuine leather, trendy and retro, soft and breathable, will not irritate your wrist, nice replacement for lost or damaged bracelet. AVAILABLE LENGTH: [6.7-8.3 Inches/170-210mm]. Precise multiple holes design for you to adjust the bracelet to a suitable length easily. You don't need to worry about the improper size. 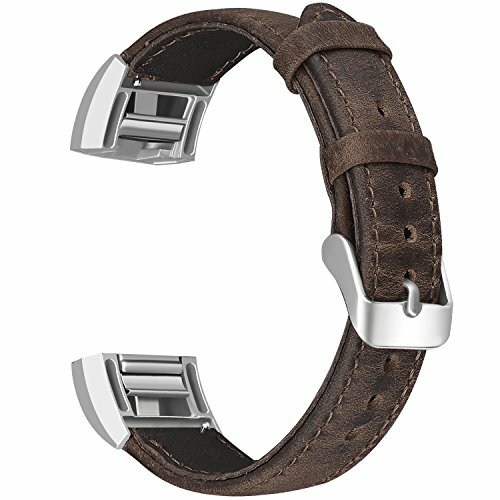 DOUBLE PROTECTION: A stainless steel buckle and two genuine leather fastener rings can help to keep the band from coming loose and falling off effectively. EASY TO INSTALL: A quick fit metal connector for you to install the Fitbit Charge 2 fitness tracker with the band. No tools are required. Just swap, click and go.